Haywire wines are consistently gorgeous. It doesn’t get much better than this on the BC wine stage. When you’re committed to using organically grown grapes, and providing little intervention in the cellar – no additives or oak, indigenous yeasts and fermentation and aging in concrete – you can’t help but produce high quality wines. These grapes are from the Terry Waters and Cathy Banks vineyard in Summerland on the west side of Okanagan Lake. On the eyes, it’s a medium lemon with the nose showing fruit salad, green grape, melon, lemongrass and minerals. The palate is dry with sharp acidity and flavours of pineapple, honeydew melon, mint and Meyer lemon with rocks. WSET Very Good plus with no mouth puckering gooseberry or cat’s pee (yes, I wrote that) so often found in Sauvignon Blanc. Just beautiful wine. 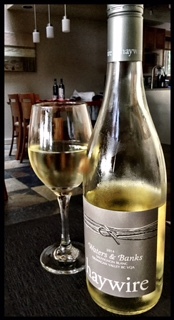 This entry was posted in British Columbia, Sauvignon Blanc, WHITE and tagged 13% abv., 2014, BC wine, Canada, Haywire, Matt Dumayne, Okanagan Valley BC VQA, sauvignon blanc, Summerland, Waters & Banks, white wine. Bookmark the permalink. I love what you said about the fact that if you are using organically grown grapes you can’t help but make great wine. Well, it helps that they are amazing and of course and have Matt on hand ;D But quality counts for so much!